Machine-vision: New PI-MAX4 - Scientific ICCD Cameras Offer Picosecond Gating Capabilities! New PI-MAX4 - Scientific ICCD Cameras Offer Picosecond Gating Capabilities! 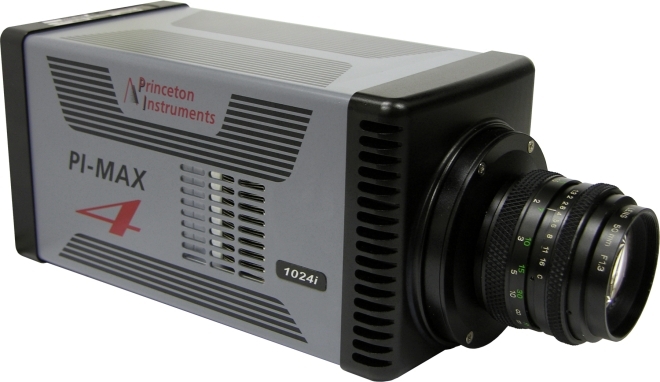 September 14, 2012 — Princeton Instruments (Trenton, New Jersey, USA) is pleased to announce the launch of its PI-MAX4 series of intensified CCD cameras for time-resolved scientific imaging and spectroscopy applications. As the most recent additions to the acclaimed PI-MAX® product line, these fiber-optically coupled ICCD cameras are capable of <500 psec gating and afford users comprehensive control of experiments via new Princeton Instruments 64-bit LightField® software. The new PI-MAX4 cameras are available in two different pixel formats, 1024 x 1024 and 1024 x 256. Both cameras use newly designed, ultra fast gating electronics to achieve <500 psec gating. The performance is achieved using traditional Gen II and Gen III intensifiers, as opposed to tubes with metal grid underlayer which compromise sensitivity and spatial resolution. Both camera formats include a built-in precision timing generator with 10ps resolution , boast superb system linearity, and utilize a high-bandwidth GigE data interface. Fully programmable trigger inputs and outputs eliminate the need for an external timing generator. The PI-MAX4:1024i achieves 27 fps, even at full 1k x 1k resolution, which is further increased with ROI and binning. The 1024i model is also capable of DIF (Double Image Feature) where two full resolution images can be quickly captured with <450ns intra-frame time for applications such as particle imaging velocimetry (PIV). The PI-MAX4:1024x256 has been designed specifically for spectroscopy and offers twice the readout speed of previous-generation ICCD cameras. Applications include fluorescence lifetime imaging microscopy (FLIM), time-resolved imaging and spectroscopy, combustion, plasma diagnostics, combustion research, planar laser-induced fluorescence (PLIF), and particle imaging velocimetry (PIV). PI-MAX4 cameras are fully supported by Princeton Instruments LightField 64-bit data acquisition software platform that has been designed “from the ground up” for scientific imaging and spectroscopy. The software provides innovative an oscilloscope-like visual interface for setting up complex gating sequences with ease. In addition, it provides streamline experimental setup, data acquisition, and post processing functions. LightField is an excellent solution for multi-user facilities with user customizable settings.